If you’ve been injured and are facing a personal injury or similar lawsuit, you can get the money you need to make ends meet while your case is in litigation with a lawsuit loan. These cash advances are available to residents of Chicago, the surrounding suburbs, and the rest of Illinois, and it takes just 30 seconds to apply. After a car accident or other injury, several things tend to happen. First, you likely find yourself faced with extensive medical or surgical bills. Next, you’re likely going to spend some time out of work. And if you’re facing a lengthy, drawn-out lawsuit on top of all the rest, you may find it difficult to make ends meet. Personal injury, negligence, and other types of lawsuits tend to be very complicated cases, and can often get held up in court for months on end, which could leave you without an income for an extended period of time. However, with a pre-settlement cash advance, you can get the money you need to keep yourself afloat while your attorneys work on your case. 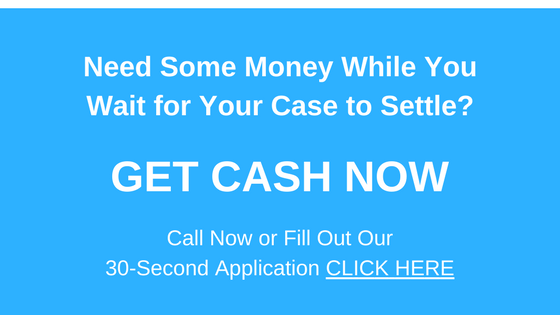 Fast cash lawsuit loans offer as much as $5,000, and you can receive payment in as little as 24 hours. Whether you need to pay your rent or mortgage, buy groceries, pay medical bills, or even get a little break away from the stress, the money is yours to use how you wish. Better yet, this type of lawsuit loan is a risk-free, non-recourse loan, which means you’ll only need to pay it back if you win your case or it settles; and in that case, the repayment will come straight out of the settlement proceeds. If you lose your case or it fails to settle, you don’t owe anything. Either way, the money is yours to keep. Plaintiffs living in the Chicago area and across the rest of Cook County and Illinois should contact Interstate Lawsuit Funding when they find themselves in need of a lawsuit loan. Our direct lending service is staffed by loan professionals who know Illinois law very well, and can provide you with an immediate decision on your cash advance, no matter what stage your case is in. We do not require a credit check or any collateral; when you apply for one of our loans, we’ll speak with your attorney, review your case, and determine your eligibility. If you’re facing a case including animal attack, assault, discrimination, negligence, personal injury, slip and fall, and more, you owe it to yourself to contact Interstate Lawsuit Funding today. Give us a call at 954-946-0487, or fill out our easy, 30-second application online to find out If you qualify today.